Our aim is to simplify and reduce the time you spend post-processing LiDAR data. 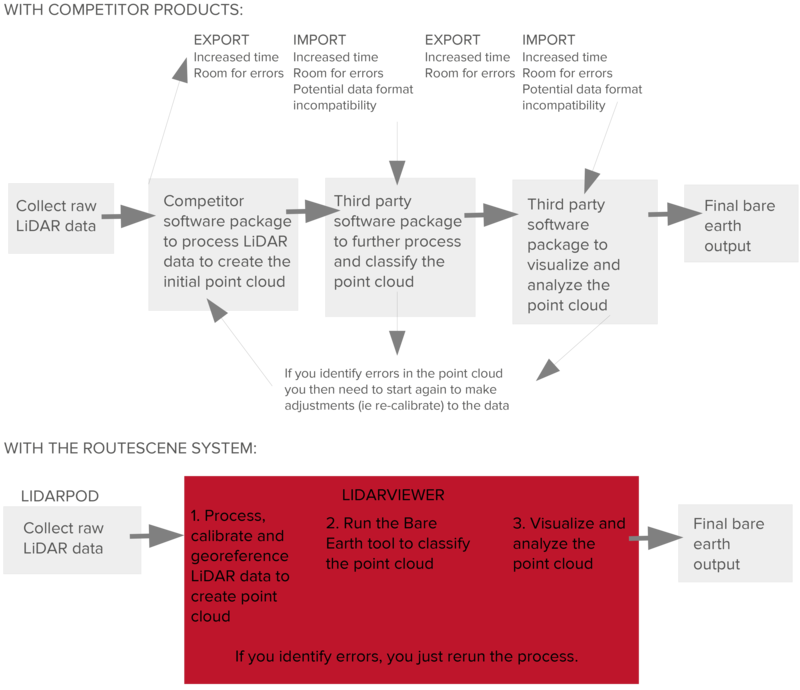 We know that creating bare earth model or Digital Terrain Model (DTM) is one of the most critical steps in LiDAR data processing on which your subsequent analysis is then based. Achieving bare earth modelling quickly and easily is the ultimate goal. With our new LidarViewer Bare Earth tool you can do just that. In one step with our automated process you can quickly and cost-effectively remove all non-ground points and reveal the ground surface. Brilliant. All classification processes start with establishing a bare earth (DTM) then building on this. detection and analysis of cultural artefacts. determination of vegetation and forestry biomass. Saves time – a real game-changer We know our new Bare Earth tool saves at least 2 hours of data processing time per iteration of a data file. Case study example: In 2016 we undertook a powerline inspection in the UK covering a 12 km long by 400m wide powerline corridor, a difficult project over complex terrain with flight restrictions. The raw data was captured across 20 data files and took over 6 weeks to process. With this experience we developed our Bare Earth tool. Using LidarViewer and our new tool it will now take 1 week to process the same dataset. Streamlined classification processing Transforms data classification from a difficult, often command-line based process, time consuming and manual interpretation process to a simple, automated process using only 1 software package. At the press of a single button you can generate classified point clouds.